My birthday is not such a big deal to me—it never has been. Falling in September it seemed to get lost in the mix of school starting and others birthdays falling near it—my younger brother Mark was born on Sept. 11 and my mom’s birthday was on Sept. 30. 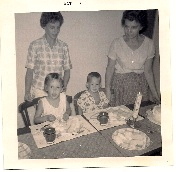 When I was 4 the group parties started, Mark was born the year I turned 4. I will never forget that birthday. Before I expound on why that birthday is so significant, it is important for a bit of a back story. Please stop reading at this point, if you become bored easily with family stories—for me, this story is begging to be told, if only to stay within the walls of this blog! I remember my mom’s pregnancy and looked forward to having a baby brother, I was already a big sister–my brother Brad was born 18 months after me and our family of four was a happy one. 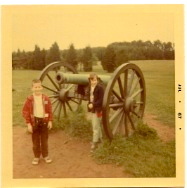 We had lived in Fairfax, Va. where I was born at Ft. Belvoure and Tacoma, WA, where Brad was born. My dad was in the military serving his ROTC years after college, and I remember him coming home from whatever he did during the day, playing with us, he was larger then life to me, my daddy. Daddy would always make everything better, but there came a time when he couldn’t no matter how hard he tried, but in later years he gave up–he could not fix Special Needs. We learn to live with it or we run from it. By the time Mark was born, my dad was out of the Army and we had relocated to Jupiter, Florida. Dad was working for Pratt and Whitney—we were to become known as Pratt Brats within the community. In the 50’s the space program was growing, the history of those years, the growth of South Florida are ingrained in me—part of who I am today–and another blog topic for another day! 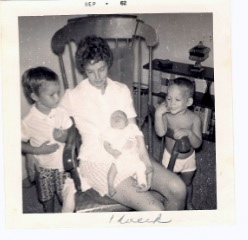 Mark was born in West Palm Beach, accessed by US1 or A1A, I remember waking to Grandma Sears (my mom’s mom and one of the women I am named for–Ruth Marie Sears–a beautiful lady!) telling me mom and dad were going to the hospital and soon I would have a baby brother or sister. I was so excited–to me it would be a baby doll come to life! Little did we know that the baby doll would fill our lives with joy and extreme sadness at the same time for many years to come. Mom and dad brought Mark home, after an extended stay at the hospital, due to complications at birth. I was told he was sick and he needed to stay with the Dr. a little while. I thought he was the most beautiful baby, of course at 4 years old, my point of reference was a bit limited! I held him in my arms and loved him! He was born with a club foot and soon would need surgery to correct it. I am unsure of how all that went down, if he came home and then went back to hospital or it was done in the hospital before coming home, all I knew is that my baby brother needed special care and mom told me she was counting on me to be her helper. This all happened somewhere between Sept. 11 and my birthday on Sept. 21—Grandma Sears was still staying with us and I think she tried to give me a special birthday and baked a cake, angel food—-my favorite to this day! I was told I got a baby brother for my birthday—I was so happy! And when mom told me she was counting on me to be her helper—I took that very seriously! Little did I know the road our family was starting down and how much of a helper I would become. 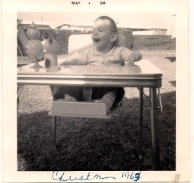 Today at 54, I can tell you the journey from that 4th birthday to today has been a wild one—lots of stories, but I shall spare you many gory details! When Mark finally came home with a cast on one of his little legs, mom and Grandma Sears noticed that he was not achieving the milestones of a newborn, and as he approached age 1, he did not roll over or recognize mom or dad–things he should do—he did push himself up on he hands, smile and start to say AHHHH! I would lay next to him on my tummy, after I came home from kindergarten and push myself up and say HI! He would copy me and we played like that for hours! It was pure joy to see the little developments he made. His laugh was so infectious. Mark never progressed past that newborn pre rollover action—he remained a baby—but his body grew into a young man—needing all the care a baby needs. Requiring hours of feeding to nourish his body, bottles and baby food. Mom and I become hooked on the “stories” on TV–I would relieve her from feedings when I came home from school at 2 p.m–just in time for General Hospital (still my favorite soap opera! ), so she could get housework and dinner ready for the family. Brad would help too, but I took the roll of Mark’s helper very seriously and never thought Brad could do it “right”–I became very assertive about my baby brother. To the point of kicking a lady in the store when she and her friend pointed and laughed at us—Mark must have been about 10 then, to take him to the store mom had to fit him into the baby seat in the cart, doubling him over, he had no muscle tone and folded up quite well (no ADA accommodations or adapted carts back then ) —the lady and her friend even told my mom, she should not bring Mark to the store and that her other two kids were running wild and being neglected, I think the lady even told my mom to put Mark in a home–Brad and I were playing, being kids in the store–today I marvel at how my mom did it! When I saw my mom cry, I kicked the lady. That is one of my most vivid memories of those times. There are many happy memories too—Driving in the station wagon, with Mark laying in the back, along Skyline Drive, picnicking at the Gettysburg Battlefields, with Mark on the blanket while Brad and I climbed cannons, Sunday drives through the backroads of Va. rooting through barns for antiques with mom, flying to Indiana to visit grandparents in a small Cessna my dad piloted–My parents found ways for the family to travel and enjoy the outdoors, still accommodating Marks’ limited abilities –it was easier for them to find ways for us all to have fun when he was small, but as he grew our family activities became limited. My dad progressed with Pratt and Whitney, becoming an executive, his job took him back to Washington DC to work with the Defense Dept. as Pratt’s liaison and then back to Jupiter again to work out of the Jupiter plant. When we moved to Country Club Drive in Tequesta, Brad and I joined the ranks of the Pratt Brats at Jupiter Middle/High School—we were in Paradise–Jupiter in the 60’s and 70’s was AWESOME! I am so grateful that my life is influenced by those years. Playing in the Lox River with manatees and dolphins, camping and surfing on the beach, riding in swamp buggies and airboats—the best way to grow up! As we prepared to move into this awesome house, and dad’s position in Pratt required more travel, along with entertaining influential government people (my mom could pull together and diner party in 10 minutes, she was amazing!) to sell the Pratt Engines, it became harder for mom to care for Mark at home, his medical needs were increasing. 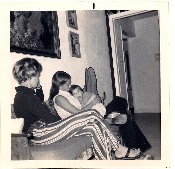 Our parents made the difficult decision to have Mark placed in a facility in 1970. Back then, these were not nice places, my mom resisted it for a very long time. Needless to say the care of Mark over the years put a big strain on my parents marriage, resulting in an ugly divorce many years later. They both lived with many demons connected to being the parents of a severely disabled child. Today I embody their best qualities, no demons—only joy– coming to this place has been a process of many tears, grief and love—I miss them both deeply on days like today. When we moved to Tequesta, I enrolled in Jupiter HIgh School, I was Ruth Finch and I had one brother known to the world. Mark was living in Maitland, Florida at the Kraddle Kare home. I cried and cried the day we left him there, it was a nice place but I was confused. Mark had been the focus of my youth and preteen years, any plans that were made for me to participate in activities with other kids revolved around his feeding times and when mom would be available to take me—it must have been a nightmare for her to plan Brad’s and my activities. Often I did not get to do the things other kids did. She did her best, becoming the leader of my Brownie troop so we could meet at the house, she could be my mom and still be near Mark—I was not always the most grateful kid either, battling for her attention or displaying passive/aggressive kid behavior. When he passed away, I was 17 and it was my senior year of high school. It felt so strange to have this huge life event happen, the death of a brother, without a community to share it with. None of my friends knew much about my brother, nor had ever met him. As a family, we went out to the ocean and sprinkled his ashes. It was odd, it seemed we had been grieving for so long and now it was over. My parents were not getting along much at that point—my memories of that boat trip are very hazy. One thing my mom did, and I was a part of with her, is to lobby the US government in the Kennedy years for laws under the ADA to give assistance to families who have disabled children. The premise of that first parent group, which she founded, was paying school taxes and paying for private services for their special needs children was unfair. Special Needs children were being denied school services due to disabilities, and affordable respite care was not available. Her work resulted in the passing of PL 94-142, the precursor to the current IDEA laws. This would help me later in college–it is amazing what a kid learns by osmosis, when taking care of her brother and listening to her activist mom at the meetings! As a teenager, entering into High School, I was not very socially prepared, boys and the teenage social stuff confused me. My High School memories are not supper awesome, not do I have many bonds from that time in my life. The one area I excelled in was the Student Council For Exceptional Children and volunteer work at the local ARC preschool. Go figure! Mark not being in our family, gone and out of sight, left a hole for my mom too—our family dynamics changed quite a bit. Dad traveled a lot for his job, mom went with him sometimes, but most of the time she was stuck with me-an angry confused young lady. She became active in the local ARC and was hired as the first Child Find Advocate in Palm Beach County. She was amazing, but I did not see it then. Brad, who was going through his own things. To me it appeared he was the new favorite child, gaining all the attention, today I know he had his own issues, we never talked about them back then, nor do we dwell on it now. Brad jumped into Jr. High and High School, excelling at sports, he made a fantastic niche for himself, going to college on a sports scholarship, meeting an awesome lady, who is now his wife—he has become THE BEST Dad and Grandpa I know! His legacy, he is giving the world through my military nephews is amazing! It was not easy for any of us, but we are stronger people today for what we went through, we are able to embody the Grandpa Finch’s motto—“It does not matter if you become a ditch digger, but be the best GD ditch digger you can be!” We are a blessed family! 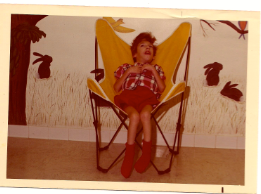 Today at 54, I realized that 50 years of my life has been influenced by Special Needs. When I went to college, everyone said I should major in the new and upcoming field of Special Education—I tried to run from it in many ways—almost got kicked out of USF! When I took an intro to Special Ed class, I got the first college A in the two years I was enrolled, and here I am today! I have been married and divorced—never had children of my own, regretted that at one time—but now am grateful God set my life up in this way. I see how His plans have pushed me to be part of something REALLY BIG and REALLY GOOD! Happy Birthday to me! God has blessed my life in ways I could never have imagined on that 4th birthday! Pondering on the next 50 years fills me with wonder—–My God will ensure it is going to be a wild, crazy and fun ride! This was taken shortly before Mark passed away. I still wonder what gains he would have made if he could have experienced the Special Needs services we have today.